Spring has sprung! There's no better way to get into the sunny spirit than surrounding yourself with flowers. Looking for the best flower arranging classes in London to learn that new skill? We bring you the pick of the bunch from London’s top floristry schools. From one to three day intensive courses, to quick and easy bouquet-making sessions, see if you have a talent for flower arranging by trying your hand at one of these courses. A lovely hobby to get into this winter – and one that will certainly make all the difference to your interior décor. The pioneers of contemporary British floristry hold special festive masterclasses and courses every year, attracting aspiring florists and beginners alike from far and wide. We attended the one-day Christmas course, held in the airy upstairs workshop and led by charismatic teacher Sophie Powell. The classes are tailored for all budding florists regardless of experience with perfect step-by-step demonstrations, although it is soon clear that many of the students are returning customers eager for another chance to work alongside Giuseppe and the team. In contrast to the professional workroom, the class has a relaxing and calm atmosphere whilst the Christmas music, mince pies and mulled wine provided throughout the day really help bring some festive inspiration to the wreath-making process. True to classic McQueens style, we used resources of the finest quality to create a stylish and striking Christmas wreath in the morning, followed by a festive centrepiece adorned with red roses and blooming orchid heads to be proudly displayed come Christmas day. The school has managed to create the perfect balance between educating its students on the technical aspects involved whilst still allowing individual flair and creativity to shine, meaning we all leave with unique and personalised Christmas arrangements – not to mention the most wonderful sense of achievement, too. McQueens offer a range of one day masterclasses, as well as one and four week vocational courses. To mark the much-awaited arrival of spring, they are hosting a number of seasonal workshops, including Spring Seasonal Wreath, Spring Classic Design, and Spring Showstopper, all of which are designed to equip students with floral design ideas that they can replicate at home. 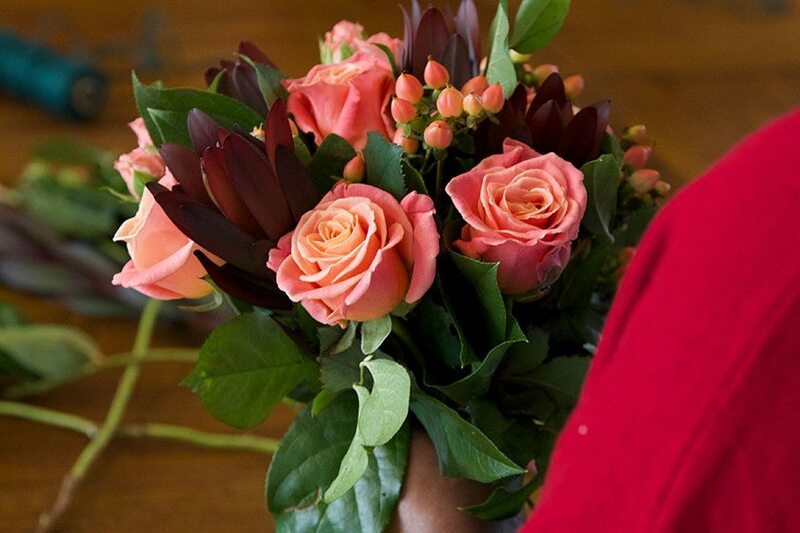 If you’re a beginner after something more in depth, their one week Introduction To Flower Design one-week course will perfectly fit the bill. Classes from £225. Find out more about McQueens flower workshops here. I was treated to a preview course with the great Wagner himself despite being a total beginner, and I was impressed by how much I managed to achieve in such a short space of time. In a private studio at the South Place Hotel, I was taken through the basics of how to choose and cut flowers, and watched in awe as Wagner masterfully arranged a floral table centrepiece in hues of white, pink, lilac, purple and green. Chatting away as he did so, he gave away some of his top tips from a lifetime in the flower business; the most important being ‘don’t fight against nature!’. Wagner encouraged a more natural and loose grouping of the flowers, similar to how you will find them in your gardens. Revealing the creative freedom that is central to his work, Wagner emphasised the importance of trusting your eye as opposed to simply following rules, and once I started to do this I understood why the school’s formula for nurturing individuality works so well. Once I was provided with the materials and knowledge that I needed, and feeling inspired by what I had witnessed, I surprised myself to have created a beautiful arrangement which I was proud of. Despite using the same flowers as Wagner, mine came out completely differently, reflecting not only the natural individualism of the flowers I chose but also my own personality. Meaning of Flowers: What Does Your Favourite Flower Mean? The workshops take place in an arty Hackney studio that they share with a set designer (think mannequins and hanging paper rainbows alongside the duo’s vintage vases picked up from car boot sales) and range from Winter Fresh Flower Head Dressmaking to Autumn Vase Arranging. I do an Urn Vase and Jar Arrangements class, with eight jolly women at two wooden tables. Anna and Ellie work as a double act. ‘Condition everything first…’ says Ellie. ‘I’ll start with this little bunch here,’ adds Anna, starting to strip the foliage off the stems. (Their flowers are mostly English. ‘They have a delicacy and divine scent that things that have travelled haven’t got,’ says Anna, passing round blooms for us to sniff. ‘We’re getting some flowers from an allotment in Walthamstow,’ interjects Ellie excitedly.) ‘Now I’m going to talk you through a jam jar arrangement then you can go and have a play,’ explains Ellie, teaching us to spiral the stems. We work from buckets filled generously with dahlias, hydrangeas, ranunculus, jasmine and foliage. Then we do urn arrangements in 1950s vases. ‘Build a fan shape of foliage at the back,’ instructs Anna. ‘Then put bold flowers in first then play around with the delicate ones,’ says Ellie. ‘Work with different heights, the more it looks as if it was just picked from the garden, the better,’ adds Anna. It’s a blissful afternoon and I leave with two arrangements that wouldn’t look out of place in the prettiest cottage garden. If you can’t make a class, buy their delightful book. 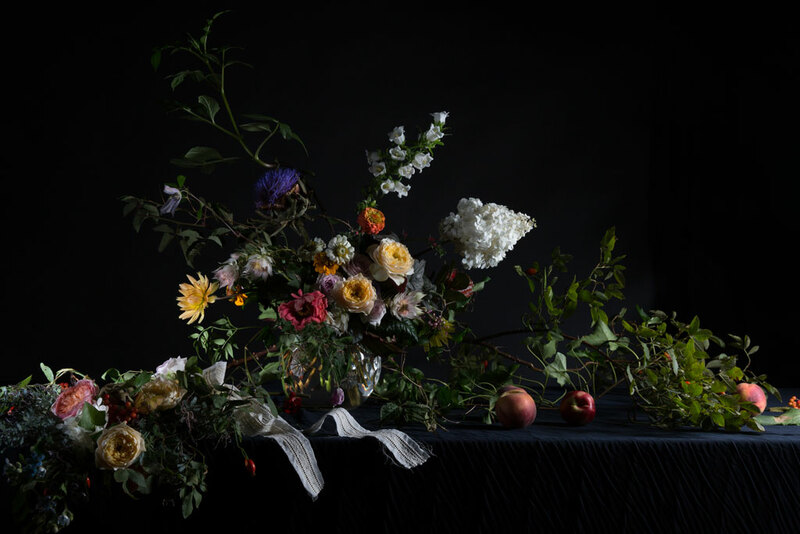 The Flower Appreciation Society, An A-Z of All Things Floral by Anna Day and Ella Jauncey. Book a class here. I do the three-day taster course with 15 women and (rotating) tutors Madeleine Mukherjee, Kim Ropek and (school principal) Gillian Wheeler. It’s for beginners. The students come from Saudi (just for the course) to Stanmore. There’s a studious, back-to-school atmosphere – a senior is even doing work experience. There’s also lots of emphasis on stretching your budget. ‘No one can afford to use all flowers,’ explains Madeleine. At the end of three days, the tutors want beginners to feel OK about flower arranging for some events (there’s a lot of talk about weddings) and special occasions at home (‘Put your foliage in the bath if you’re doing a big party’). ‘The most important thing we can give you is confidence,’ says Gillian. The school is in a courtyard of shops, with a zillion cafes and restaurants nearby for lunch. And there’s a little store upstairs that sells their signature candles, hand-wash and seasonal flowers. I leave with a topiary tree over my shoulder, a smile on my face and with an attendance diploma too. £550 for three-day taster course, includes hand-tied arrangement, a buttonhole, a wired posy, topiary tree and a circular arrangement (wreath). There are plenty of other courses from beginner to advanced, with specific sessions such as ‘Wedding Bouquet’ for £110. Find out more about The Covent Garden Academy. Classic Flower Design and Cotswold Flower Courses are now booking. The principal of the school, Judith Blacklock – a pocket size human dynamo – then takes us around the market (she’s difficult to hear, she could do with a microphone) introducing us to traders, and impressing with her encyclopaedic knowledge of flowers. Including sprouting Latin names. After an hour of flowers and instruction, we retire for bacon sarnies and steaming cups of tea in the traders’ caff. Then take taxis (Judith pays) to Knightsbridge, where JBFS is hidden in a cute mews set back from the road. The pretty classroom has big floral paintings on the walls, dried hydrangeas hanging from the ceiling and a large wooden table. Thirteen female students gather around it, sitting in front of lazy Susans, each one of us with a vase and Oasis foam on it. ‘It’s rare that it’s an all-English class,’ reports Judith, pulling in a Korean intern to redress the balance. Judith starts demonstrating how to arrange (and preserve) our blooms. And teaching us the basics. ‘How much time does it take to soak foam so that it’s wet all the way through?’ asks Judith, standing in front of her flip chart. Forty seconds, that’s how long. We do arrangements using cotinus rhus, dianthus barbatus and physalis – smoke bush, ‘green trick’ and physalis to you – while Judith fills us in on balance, proportions, colour and texture. She gives us enough practical tips to make us budding experts. Plus, we get our formal floral arrangement to take home. £150, includes breakfast, taxi from New Covent Garden and your one floral arrangement. One day taster class costs £198. Find out more here. Our instructor presents us with a bucket of beautiful seasonal flowers, already prepared for arranging (‘It’s the conditioning that takes the time before this stage, but luckily we’ve done this for you’.) We then get a demonstration of how the flowers are best manipulated into an organised wilderness of a summertime bouquet. We are taught the basics of the spiral technique, and how the movement of the stems prevents a ‘strangled’ bouquet that will ultimately prevent the flowers from blooming. Within 10 minutes of enthusiastic (and carefully angled) arranging, my bouquet is taking shape, and requires the smallest of adjustments before being secured with twine and wrapped ready to whisk away. I’ve created a beautiful arrangement packed with roses, peonies and foliage, without actually doing any of the hard work. This might not be the best option if you’re in need of serious training, but it’s a fantastic taster and a whole lot of flowery fun. With a background rooted in fashion, these guys are renowned for serious stylish results. Prices on application. Visit byappointmentonlydesign.com for more information. Workshops take place in Charlotte Street Hotel, as Bloomsbury Flowers have been supplying all London-based Firmdale Hotels with their arrangements since 1999. Stephen and Mark work as a double act, with everything perfectly set out for us on arrival. Greeted with a glass of champagne and with canapés floating around the room, the small group of flower enthusiasts were ready to get down to some floral fun. Each of us had a checklist of flowers and foliage to gather, and after watching Stephen expertly assemble his own example, starting with the smallest flowers first, we were ready to go. As we admired the beautiful vases set out in front of us, Mark revealed the often-overlooked fact that flower arranging is all about the container – from its shape to even its texture. After gathering my materials, I put on my apron and got down to business. Placing the chicken wire into the bottom of my vase to keep each flower in place, I was ready to start arranging. Beginning with 7 stems of delicate Green Bupleurum, I began snipping the ends and inserting into the vase whilst remembering to turn the vase as I go to ensure all side are even. We also added some wonderfully fragrant red tulips – accompanied by the firm reminder that tulips grow a lot in size once added to water, so we were advised that if you want them to just bloom and not grow, cut a small incision below the flower in the stem going horizontally. Six stunning Queens Red Helleborus were also inserted as the saucer-shaped flowers added a darker tone to the otherwise largely orange and yellow arrangement. To finish, we added some yellow Bandolero Spray Roses. This unique flower is multi-headed, and once added to an arrangement, perfectly fans it out whilst adding a beautiful, sophisticated touch. True to classic Bloomsbury London style, by the end of the class we had each created a stunning English spring-themed arrangement which was ready to take home and display on a windowsill for all to see. Classes take place at Charlotte Street Hotel, prices start from £115. Classes start at 10:30 am and include a Champagne lunch. Find out more about Bloomsbury Flowers workshops here. There are gorgeous decorations and flowers everywhere, including a big tree with baubles. The class kicks off with festive wine and champagne, and there are mince pies to munch on. There are five chic women and one male student… with three florists on hand to help. Think teamwork. (There’s one participant here because there’s a three-day wait for Wild at Heart wreaths – they’re labour intensive – and so she has decided to make her own. The wreaths they sell start at £95, depending on how heavily decorated they are.) We bind the moss in ‘real wire’ then use ‘stub wire’ for adding our foliage – in my case, pine, lichen with cones and eucalyptus. ‘You can add ivy from the garden,’ explains Ruth, ‘or offcuts from your Christmas tree.’ Afterwards, I wire on lavender, pinecones and grey moss. (Or, rather, Ruth does.) It looks beautiful. £150 includes refreshments and your wreath to take home. Book a Wild at Heart class here. To see Nikki Tibbles’ latest creations, visit World of Wild at Heart.